"Are we bound to fall, and loose the light of day?" I'm surprised how the last wall submited in this cathegory is my Amber wall ;-; this series should be more popular since it was great. The only thing I painted is the wall and the sky, no painty on the charachters, I don't know why since most of my walls are painty. The outlines Are actually colored, cept for the skin, I wanted to leave it darker it just looked better. It actually looks good on the desk so I'm glad. I started it a week and a half ago, I don't know how many hours thou, I work only when I have time, and I don't have plenty, plus I worked on others vectors too. I usually work on several and they get completed in no speciffic order XD On the layers part I gave up counting I had a lot, and the characthers were done separately. Oh well, enjoy or not. I can't get enough of wallies with this scan. I absolutely love the background and the way light falls on the characters. One of my fav anime, You did great job vectoring that scan. Super! great wall! very nicely done. thanks a lot! the colors and atmoshpere right in there and you did a great job. to give that distance it needs. and yes the neko placed nicely in who also blends great. It's all very well vectored and I can't get enough walls of this scan either..
great color and the bg is just awesome! 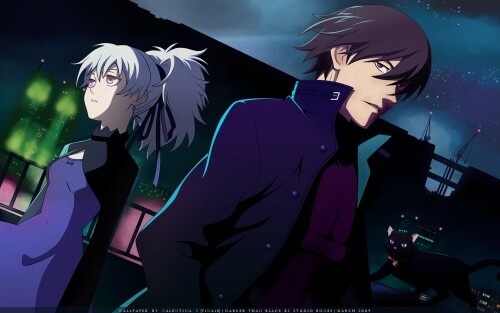 ahh i love darker than black and the fact that you vectored the cat is so pure love. agree with kitchan about the green lights, i also think that you should have spent a bit more time getting the lights to look like they are shining. just a bit of a tip, lights usually have layered colors, going from less saturated, to more saturated, to less saturated(almost white). well this part isnt that important, but to get a gradient effect without actually using gradients, you can use a round brushed eraser. adding to fav~ great wall! I was behind that image long time. Thank you! Amazing wallpaper, great team! thanks for this wallpaper ! this is so damn great! I dont know why is problem for you the buildings I think its looks great. But if you really need some idea about how to make it look better then my advice is: The 2 green smoke on the top of the twin building try to scale it up horizontally and turn down the opacity. Try to make it fogy look, and under the barrier I miss the smoke. Try it how is it looks like and let us know :D but its a damn good job! Sorry about the poor english I hope you understand it. Awesome! Great wall! Loved it!